During the DCI Annual Meeting in Atlanta on Friday night, DCI Executive Director Dan Acheson presented details about corps performance orders at regional championship events. For the DCI Southwestern Championship in San Antonio on July 22, scores will be taken from the July 15 events in Denver, DeKalb, Illinois, and Alexandria, Kentucky. Once seeded in score order, corps will be randomly drawn within groups of three (First through third, fourth through sixth, etc.). For corps not in any of those three shows, seeding will be established by using the scores on the closest day prior to July 15. For the July 29th DCI Southeastern Championship in Powder Springs (Atlanta), Georgia, corps will be seeded in score order from San Antonio and drawn randomly within groups of three. For corps not in San Antonio, performance order will be established by using the scores on the closest day prior to July 22. Originally scheduled as an eight-corps Tour of Champions series event (before the Georgia Dome become unavailable for the DCI Southeastern Championship), the performance order for the July 30th Winston-Salem, North Carolina event was pre-determined. 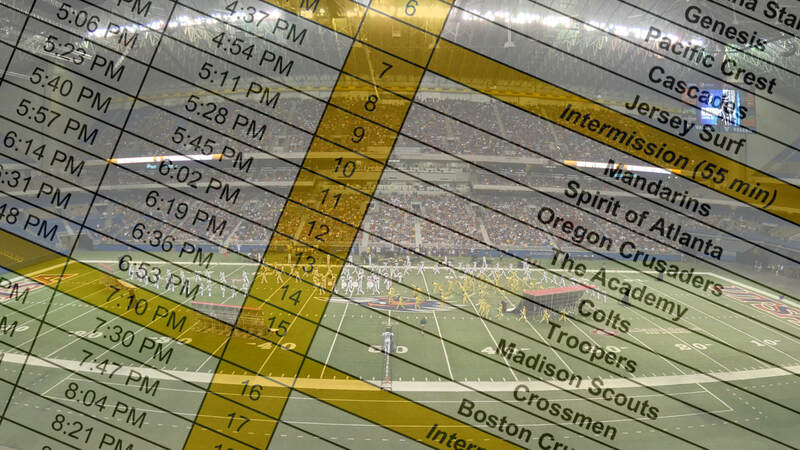 The rest of the corps added to this lineup (Blue Stars, Boston Crusaders, Colts, Crossmen, Madison Scouts, Mandarins, Troopers) will draw for performance order based on results from San Antonio. For the DCI Eastern Classic in Allentown, Pennsylvania (August 4 & August 5), seeding will be based on scores from the DCI Southeastern Championship on July 29, plus the following corps from the Winston-Salem show on July 30: Blue Stars, Boston Crusaders, Colts, Crossmen, Madison Scouts, Mandarins, and Troopers. Once seeded into score order in their respective Friday and Saturday lineups, corps will be drawn at random within groups of three. As in the past, it is expected that the performance order at the August 7 Open Class DCI World Championship Prelims in Michigan City, Indiana, will be determined by averaging each corps’ top two scores from select events the prior week. Each corps will then perform in reverse order of those averaged scores. Open Class corps directors will make an official determination on this procedure during their meetings this weekend in Atlanta. For the DCI World Championship Prelims on August 10 in Indianapolis, the first group of corps will perform in reverse order of placement at the Open Class Finals in Michigan City. World Class corps will perform in reverse order of the average scores combined from San Antonio, Atlanta/Winston-Salem, and Allentown.